Identify and categorize potential impact investment opportunities in wild-capture fisheries utilizing a combination of impact investment frameworks. In the absence of impact investment opportunities, document value chain constraints preventing such opportunities. Support the creation of sustainable wild-capture fisheries investment strategies by identifying appropriate frameworks for the assessment and development of intervention opportunities. We assessed four developing country fisheries (DCFs) in two countries, with a particular focus on Indonesia, plus one fishery in California, US, for comparison. 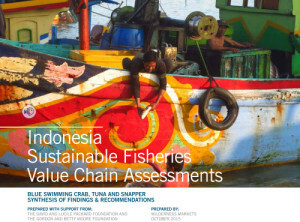 This document focuses on Indonesia and summarises our assessment of the blue swimming crab, snapper, yellowfin and skipjack tuna seafood value chains. Each fishery assessed provided a piece of a larger puzzle, allowing us to identify the components of a sustainable seafood value chain and its relationship to stock health which, in turn, drives value chain health. This document provides a summary of the findings in Indonesia. We concluded that to provide an environment for investment and long-term environmental and social sustainability, Indonesian fisheries must address six main constraints—data, management, market differentiation, infrastructure, finance and the lack of investable harvester level organizations. None of the fisheries reviewed had addressed all six of the constraints, thus hampering the ability of impact investors to make effective grant and program-related investment (PRI) decisions. Our findings further imply that addressing these constraints individually or in sequence results in significant unintended consequences . A strategy to address these constraints simultaneously is obligatory. While we found significant potential livelihood opportunities in Indonesia, these are unsustainable from an ecological perspective due to the absence of reliable management, monitoring and enforcement. The presence of a legally recognized and enforced management system is considered a prerequisite for the development of investable triple bottom line (TBL) enterprises in the sustainable seafood value chain. Simply put, a strategy to address livelihood challenges in Indonesia is likely to exacerbate stock health challenges in the absence of effective management. Indonesia’s long maritime history and the importance of fisheries to the nation uniquely position it to address the identified constraints for the long-term sustainability of its natural marine resources, poverty alleviation and economic development.